This is a list of orders, medals, prizes, and other awards, of military, civil, science and ecclesiastical conferees. See also: Category:National sportsperson-of-the-year trophies and awards. The Harry Oppenheimer Fellowship Award. The Decoration of Honour for Services to the Republic of Austria. Insignia of the Belgian Order of Leopold. Insignia of a Member of the Order of Canada. Collar of the Danish Order of the Elephant. Knight medal of the French Legion of Honour. Grand Cross of the Greek Order of the Redeemer. Insignia of the first class of the Lithuanian Order of the Cross of Vytis. Star of the Monégasque Order of St. Charles. Knight 4th class medal of the Dutch Military William Order. Cross of the Norwegian Order of St. Olav. Grand Cross of the Polish Virtuti Militari. 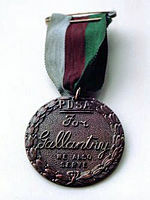 Hero of the Russian Federation medal. Insignia of the Spanish Order of Isabella the Catholic. Star of the Swedish Royal Order of the Seraphim. Order of the Gold Star of the Hero of Ukraine decoration. The American Medal of Honor. ^ "Denmark's Premier Music Award". sonning. Archived from the original on 11 March 2007. Retrieved 2007-02-09. ^ "Lettre Ulysses Award". Lettre International Aventis Foundation. Retrieved 2007-02-09. ^ "Queen & Commonwealth". Royal Collection. Retrieved 8 May 2013. ^ "Meritorious Service Honours Act Chapter 19:09" (PDF). Government of Dominica. January 1991. Retrieved 8 May 2013. ^ "Ministerio de Desarrollo Social Decreto Ejecutivo No 81" [Ministry of Social Development Executive Decree No 81] (in Spanish) (25, 554). Panama City, Panama: Gaceta Oficial de Panamá. 29 May 2006. Retrieved 8 September 2016.